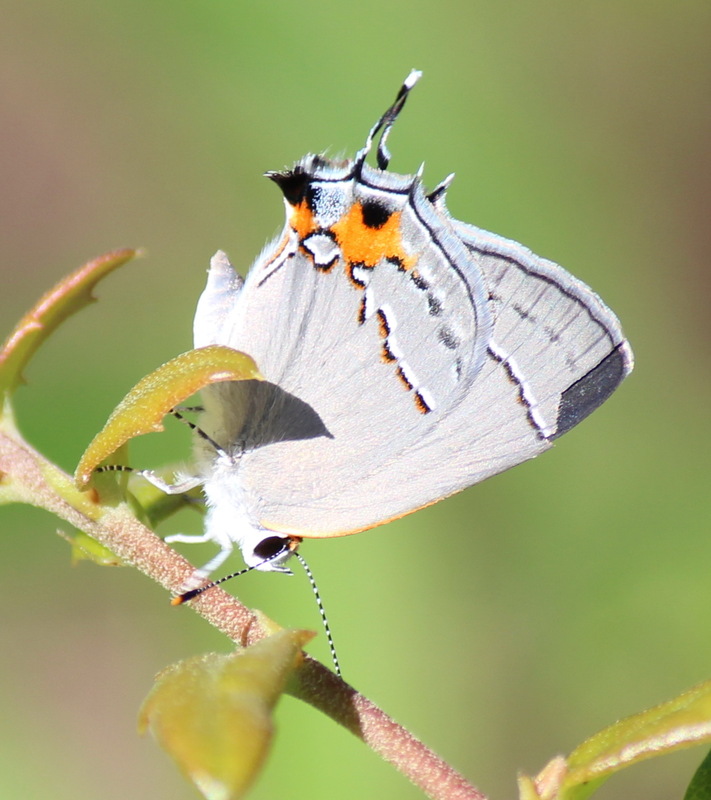 Gray Hairstreak, taking some sun on a Quercus sp. seedling. Same individual, open…quite a difference! 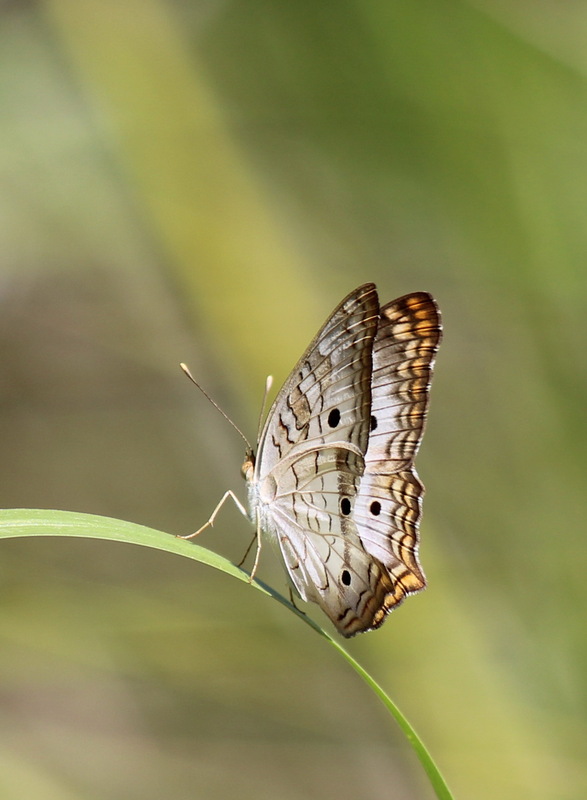 Lower temperatures, sunny skies, and plenty of still-puddled areas created fabulous conditions for spotting butterflies. Since the gravel trucks and heavy equipment are also out in force, it seemed like a good idea to take a few more photos. All of the images in this post were photographed in areas that are slated for construction. 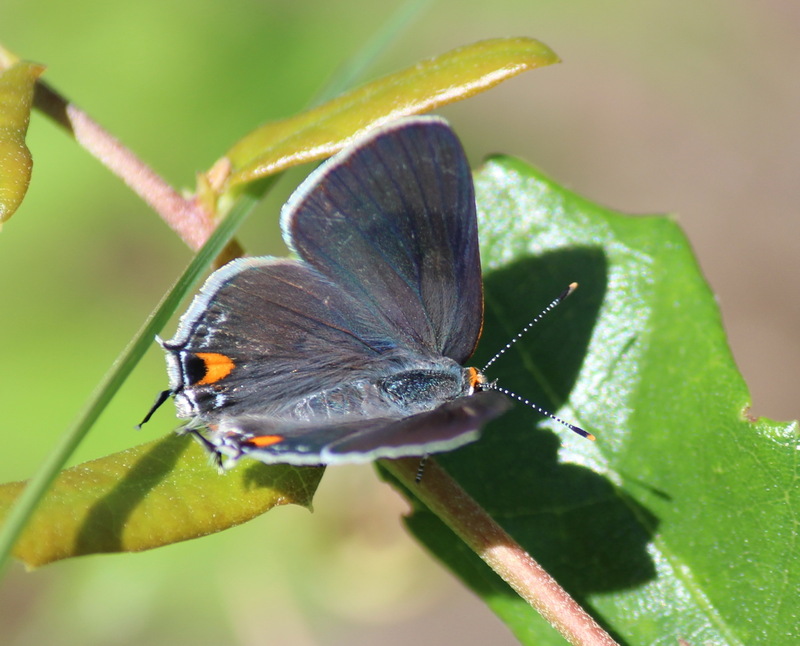 The Gray Hairstreak, Strymon mellinus, is common around here, perhaps because it has a wide variety of host plants. 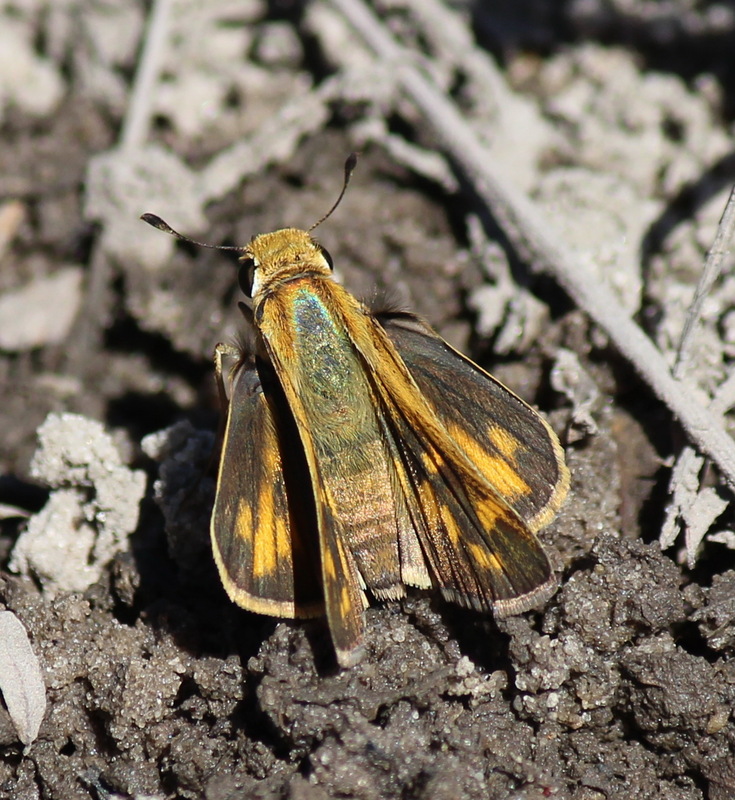 Female Fiery Skipper,Hylephila phyleus, puddling on a future homesite. Thank you BugGuide for identification. Skippers were also out in abundance – nectaring on Diodia sp., and puddling on still-damp soil. 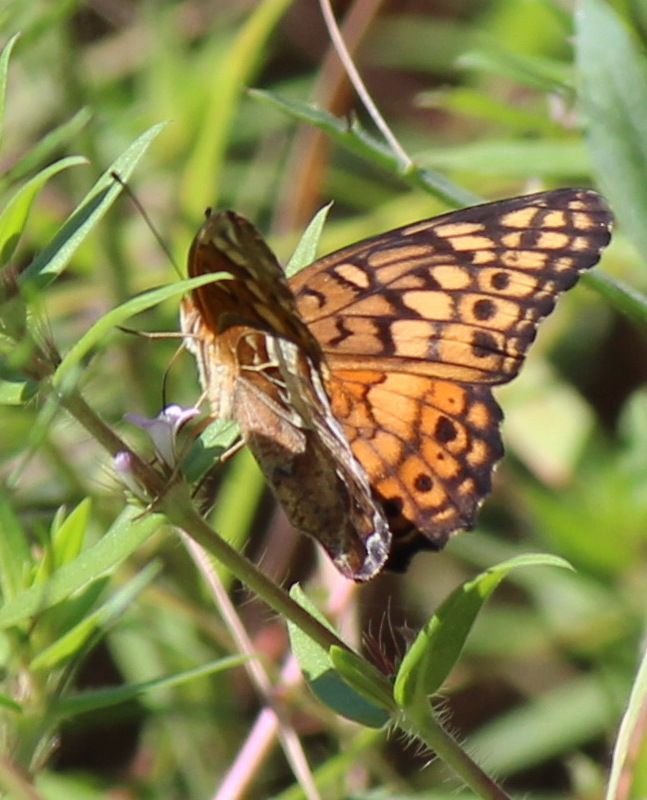 Variegated Fritillary, Euptoieta claudia, on Diodia sp., only a few feet away from the caterpillar in the photo below. 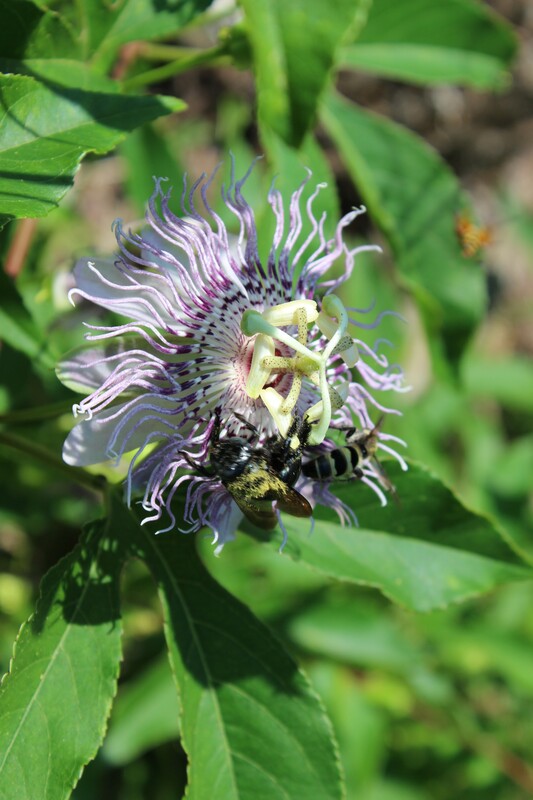 Passiflora incarnata, aka Maypop, with a couple of pollinators. Photo taken in July. Caterpillar of the Variegated Fritillary, enjoying some Passiflora incarnata. The reliable place we’ve found these over the years is now being developed – in fact, the patch was reduced to about half the size it has been, making way for a future road right-of-way. 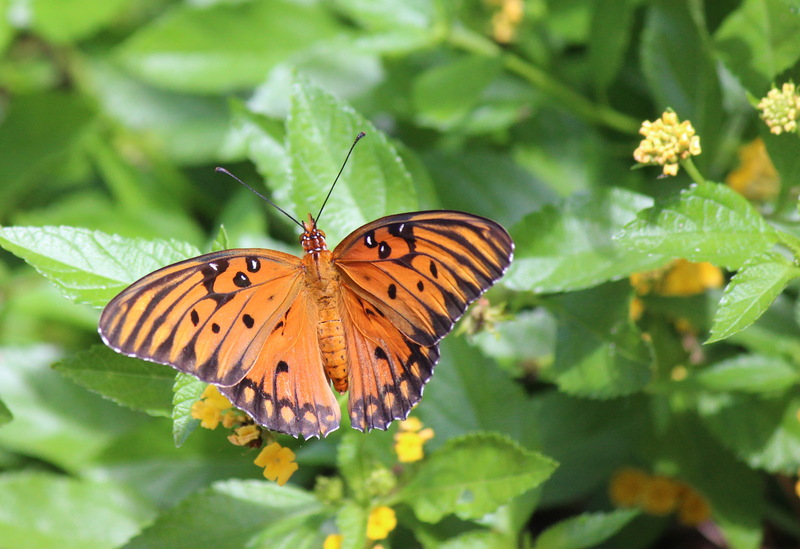 In our suburbs, the Gulf Fritillary is often seen nectaring on Lantana camera, an exotic species that is frequently marketed as a ‘butterfly’ plant. 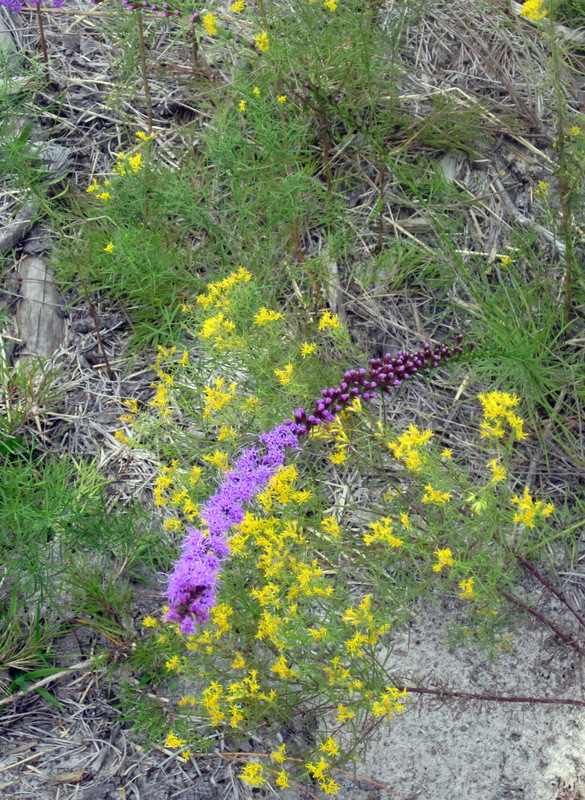 Euthamia caroliniana, aka Flat-topped Goldenrod, with Liatris sp., – photo taken a few years ago in Brunswick County. Finally!! Plus musing about larval hosts. Brand-new Black Swallowtail, possibly a female given the amount of blue on the underwings, and chrysalis, on stem of Spotted Water Hemlock. An exciting find this weekend in a neighborhood ditch…a brand new Black Swallowtail, Papilio polyxenes, on Spotted Water Hemlock, Cicuta maculata, one of its host plants! Black Swallowtails are fairly common around here, but since we’d seen so few butterflies at all this spring and summer, it was a happy day to see this ‘fresh’ one hardening up in the morning sun, right next to its still-green chrysalis. 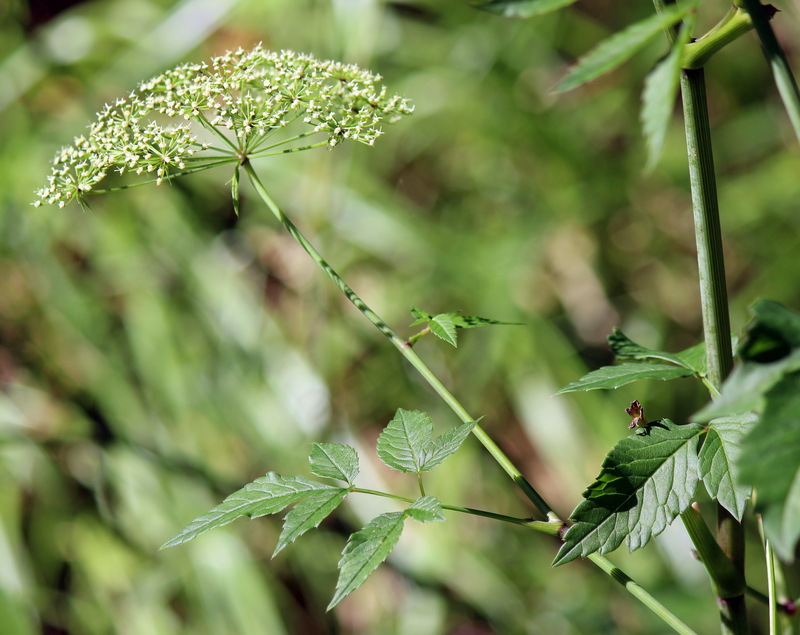 Plants in the Apiaceae (carrot) family are the primary larval hosts for this butterfly. 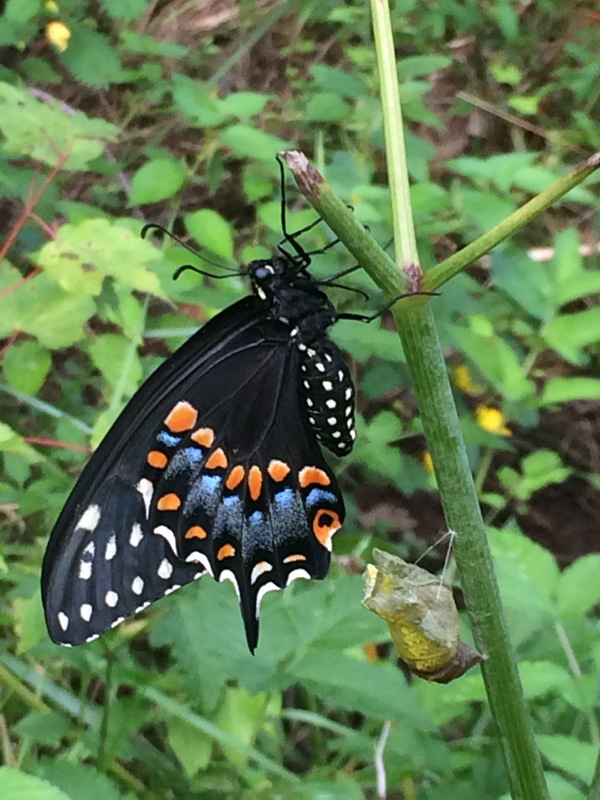 The ditch where we found this individual is bordered with Chinese Privet, Ligustrum sinense, among other exotic invasives, so it was heartening to identify a native in the mix, with the Black Swallowtail and chrysalis still attached. 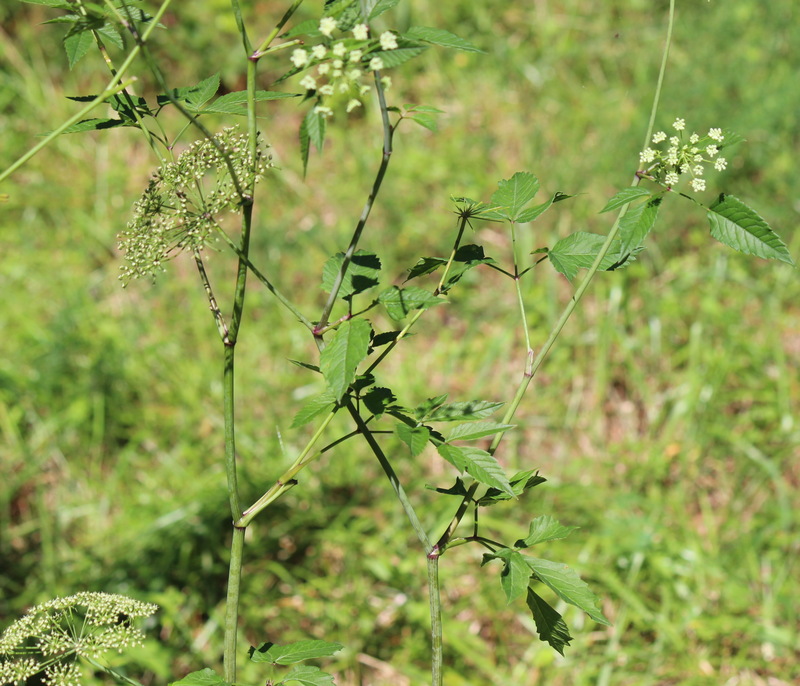 Spotted Water-hemlock, aka Cicuta maculata – where we spotted the Black Swallowtail – the chrysalis was low on the stem – about 18″ above the ground. a closer look at the inflorescence and leaves. Extended osmeterium of a Black Swallowtail caterpillar – source Styler, Wikicommons. All caterpillars of the Swallowtail family have an eversible (can turn inside-out!) forked structure called an osmeterium right behind the head. In the Black Swallowtail caterpillar, as well as several others, the osmeterium secretes smelly compounds that deter predators. 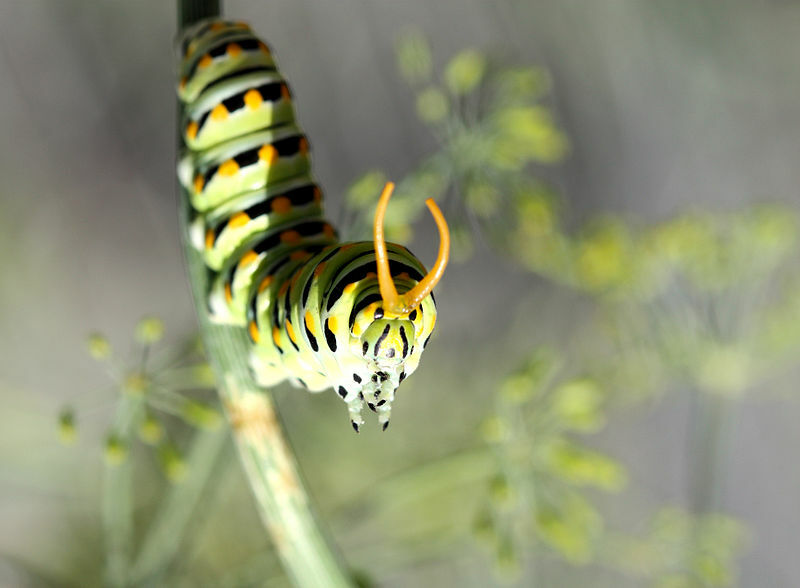 Many gardeners plant dill, parsley, carrot, fennel, and other edible (but non-native) members of the Apiaceae family to support Black Swallowtails and other related species. 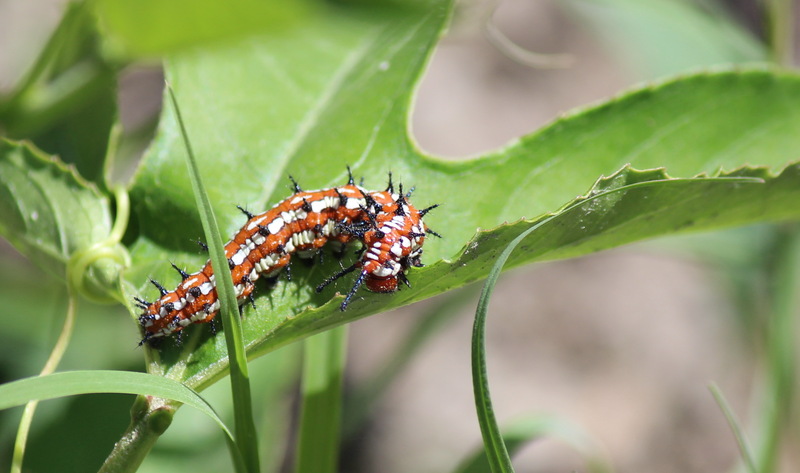 In fact, one of the common names for the caterpillar is ‘parsleyworm,’ and some actually regard it as a pest. With rampant development removing many of the native host plants from its diet, and gardeners planting less- or non-toxic substitutes, how is this species (and others…) affected? Will it make the caterpillars and butterflies more palatable, and/or change their warning coloration, and make them more susceptible to decline? Osprey, resting in invasive Australian Pine. 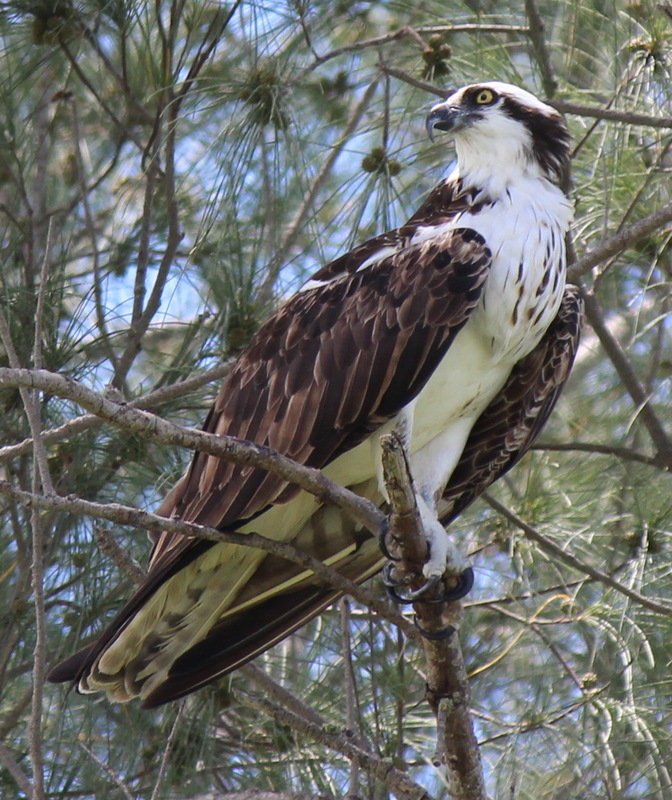 A visit to Sanibel would be incomplete without an Osprey sighting. Unlike SE NC, the population of these stunning raptors around Sanibel is partially non-migratory, so there are opportunities to see them all year. These birds, like other raptors, were in serious decline following heavy use of the pesticide DDT in the 1940’s-60’s. The publication of Rachel Carson’s Silent Spring was an alarm call. A subsequent discovery that DDT was at the root of reproductive failures in a NY Osprey population resulted in a lawsuit filed by Environmental Defense Fund founders that led to a 1972 nationwide ban on the use of DDT. 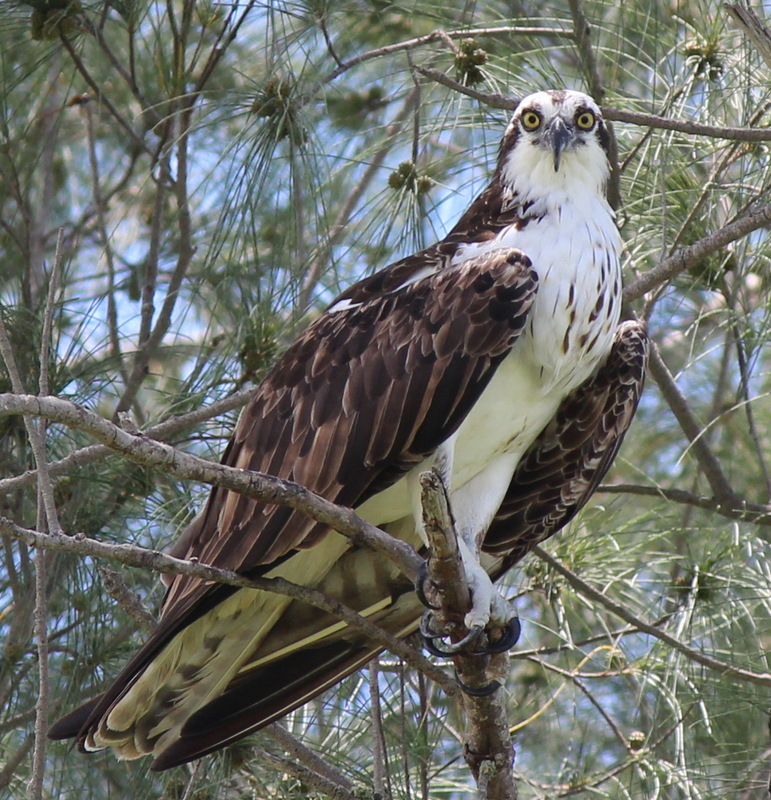 The International Osprey Foundation (based in Sanibel) reports a 400% increase in the island population from 1978 to 2003, probably due in no small part to this ban, as well as concerted efforts to protect and create nesting sites. And a nice profile. We think this is a female, based on the chest feathers. We were fortunate to have a regular visitor, although the tree it favored is an enormous Australian Pine, Casuarina sp., an invasive species that is quick to colonize beaches, as well as other newly-disturbed areas. Osprey have a plaintive call that can sound like distress, even if it is not. We thought about that a lot as ‘our bird’ stayed on one perch, looking away from the beach, for over 3 hours – with periodic bouts of PARTICULARLY plaintive calls! This bird appeared to be waiting for someone, staying in a more alert posture, and relieving herself (?) every half hour or so in explosive squirts. 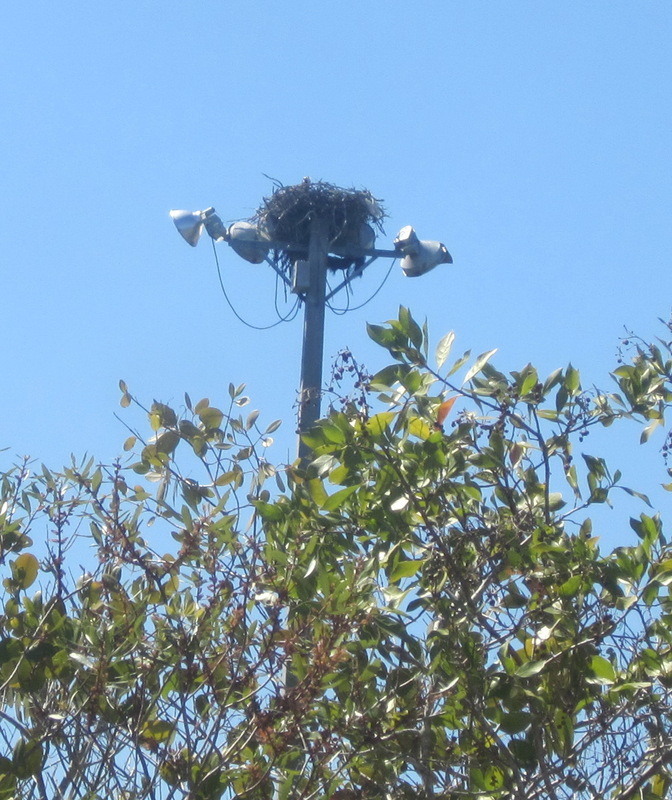 Last March – Osprey nest on lightpole structure at Ding Darling NWR. One striking difference of the Osprey population in southwestern Florida is the number of birds that nest on human structures – according to an article by Alan Poole, as many as 90% of East Coast Osprey do so, but we think this statistic must be heavily weighted towards peninsular Florida, perhaps since ‘habitat’ in this area is dominated by power poles, highway signage, and bridge structures. We think these are Semipalmated Sandpipers, excavating tiny shellfish right at the water’s edge. And finally, the easiest creatures to observe at close range are the shorebirds, who provide a fascinating demonstration in resource partitioning. The Sandpipers – we think they were Semipalmated, are in large flocks in very shallow water, skittering between thin foamy wavelets, in search of small crustaceans. 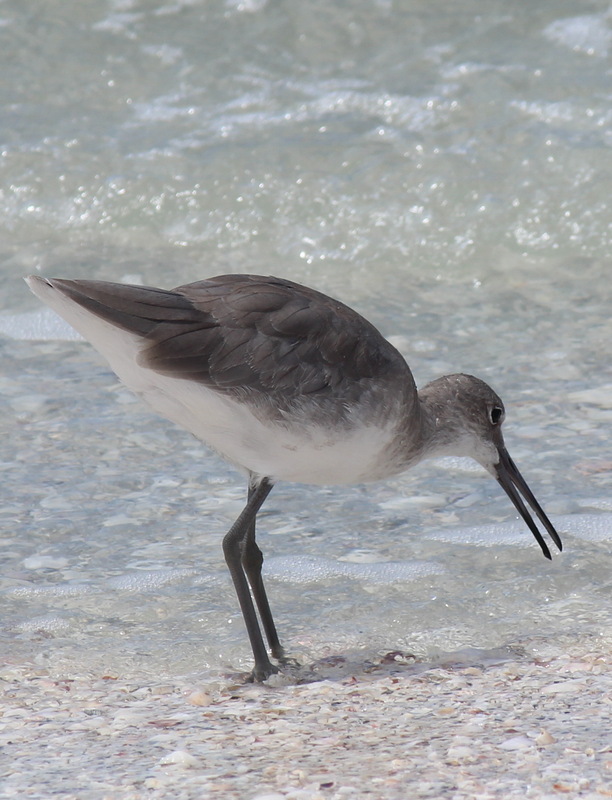 Willet, ready to snag a tiny crab. 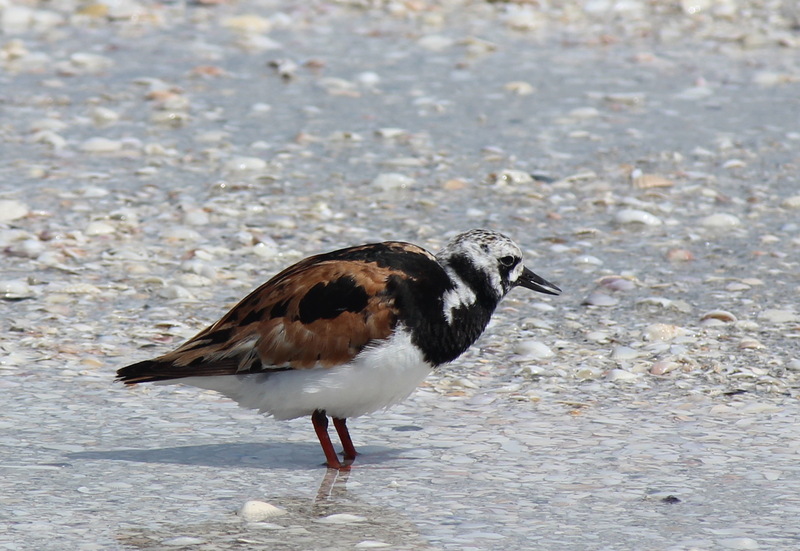 Ruddy Turnstone, pausing between turning stones. This will be the last of the Sanibel posts for awhile. It’s a magical place that demonstrates that biodiversity AND a thriving economy can go hand in hand. Good morning, from Ding Darling NWR. 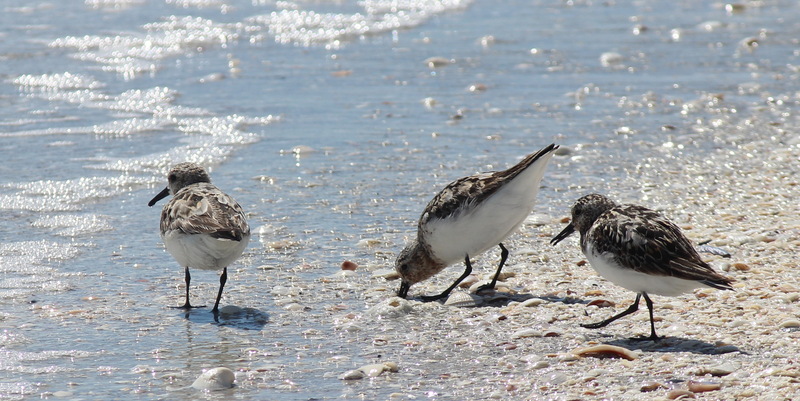 Sanibel Island has about 6500 full-time residents, according to its 2013 census data, and this population can quadruple during the busy winter ‘snowbird’ (…people, not birds.) season. Some of these visitors are nature-oriented, but the majority are not, preferring ‘beach activities’ to bird-watching. (Check out Lee County’s 2013 ‘Visitor Profile‘.) With over 25,000 periodically inhabiting less than 4000 acres, and only one way off of the islands, (if you don’t have a boat!) we find it amazing that prescribed fire is a large part of land management activities. White Peacock, at the edge of Smith Pond. 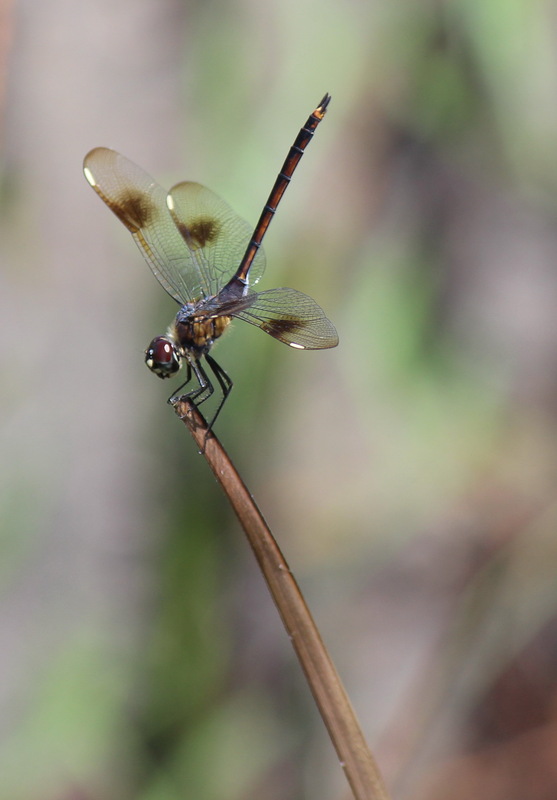 Male Marl Pennant (we think…). 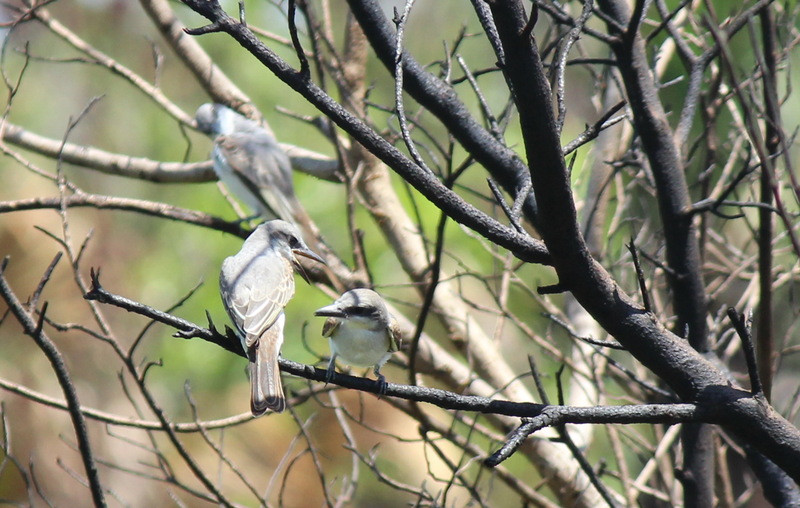 Gray Kingbirds, mid-day on burned vegetation at the Bailey Tract. 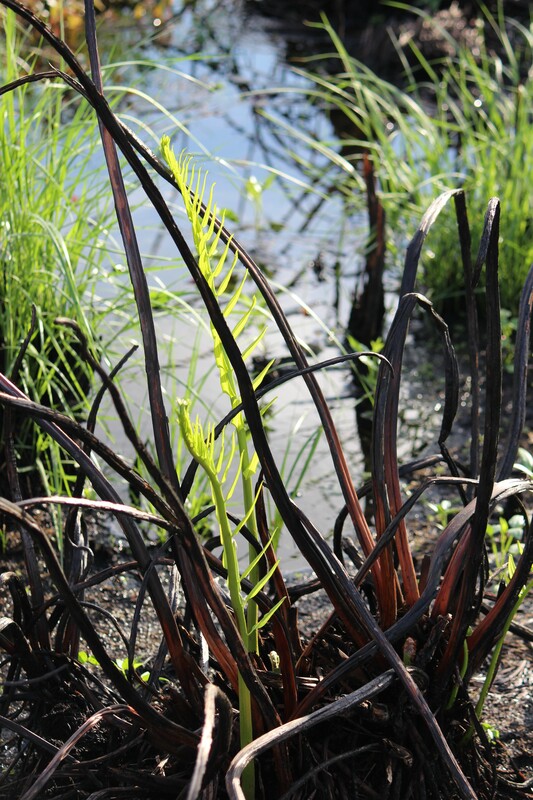 A species of Leather Fern, aka Acrostichum sp., sends up new fronds after the July burn. 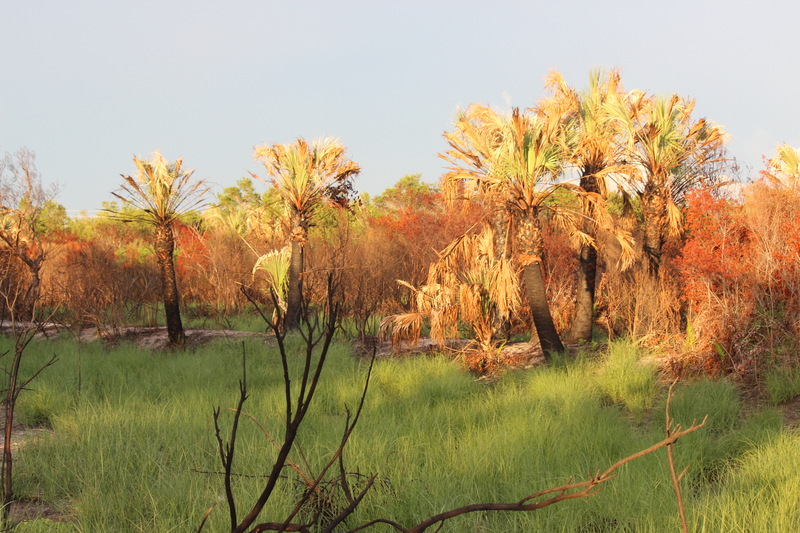 The Bailey Tract, an inland portion of the Ding Darling NWR that is burned on a regular basis, is a superb educational tool on the benefits of prescribed fire. This 100-acre parcel, framed by the Sanibel River and Airplane Canal, and containing several freshwater impoundments, is close to residential areas, a main road / bike path, and primary beach access. Most of these photos were taken shortly after a burn in mid-July, and the new growth was stunning. 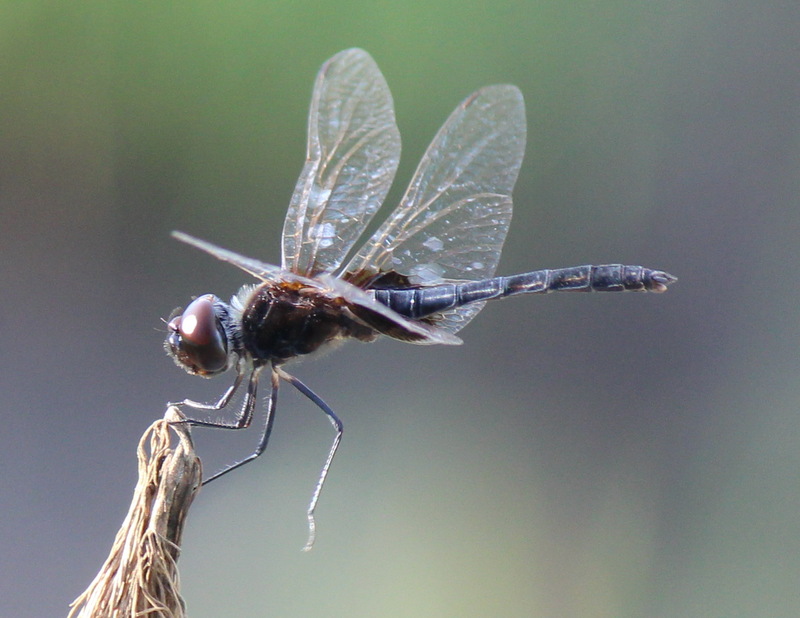 4-spotted Pennant, we think, obelisking (cooling off) on burned wetland vegetation. 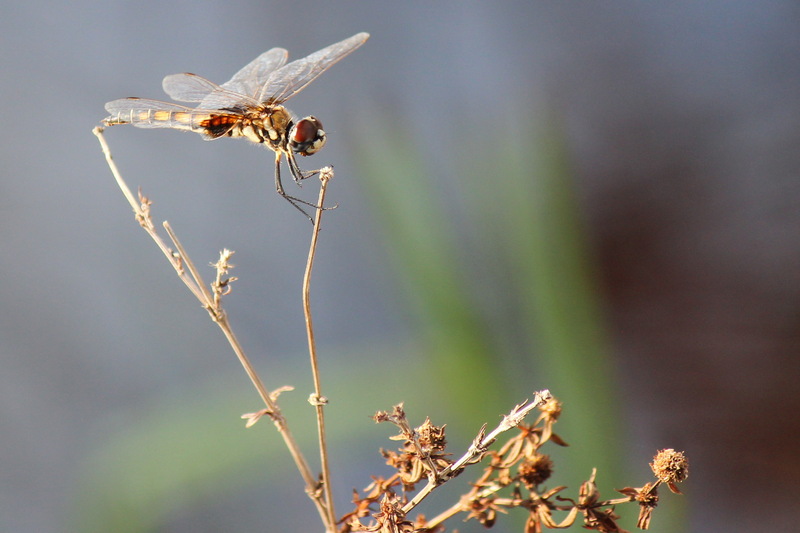 With such a recent burn (still fragrant…), it was easy to spot lots of wildlife, particularly the dragonflies, but some of the creatures with more cryptic coloration were harder to find. 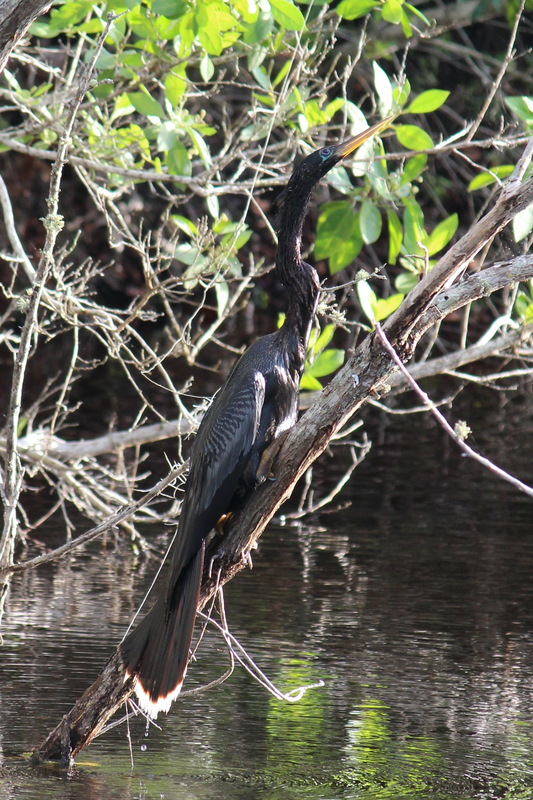 Mangrove Head Pond at the center of the tract is a great place to see Green Herons, Mottled Ducks, White Ibis, and…alligators. 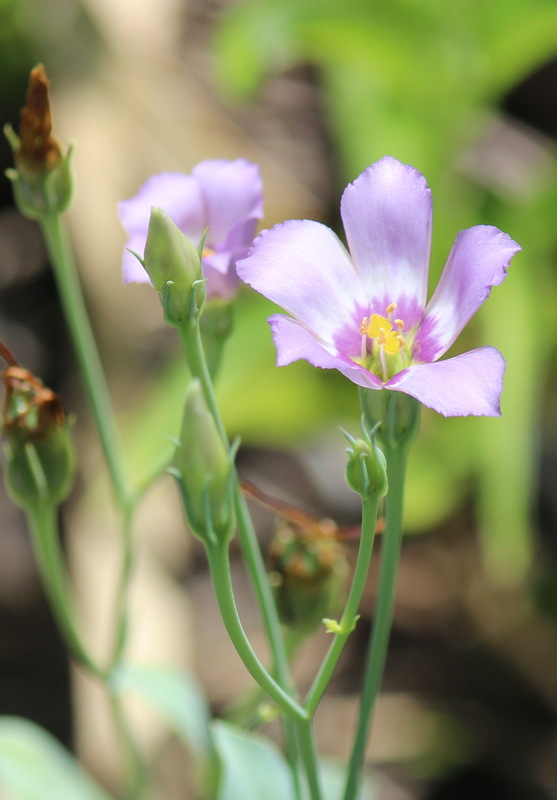 Rose of Plymouth, aka Sabatia stellaris. 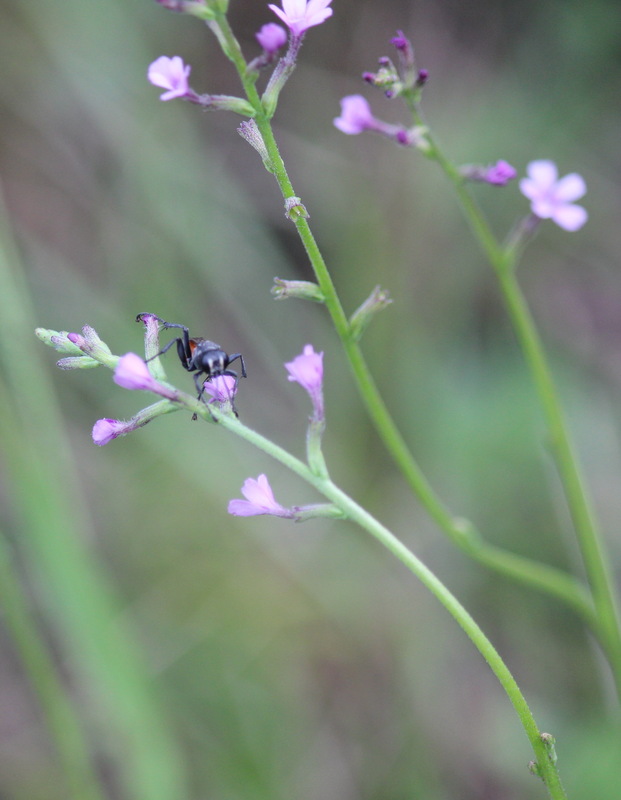 Many plants were in bloom, attracting a variety of insects. And if you are looking for White Peacocks, Anartia jatrophae, this is your place – they are everywhere. Unknown insect on a species of Buchnera, aka Bluehearts. This little tract is an interesting model for land management and restoration, thanks to ongoing controlled burns and restoration plantings. It is visible from the highly-traveled Tarpon Bay Road, and there is interpretive signage everywhere. 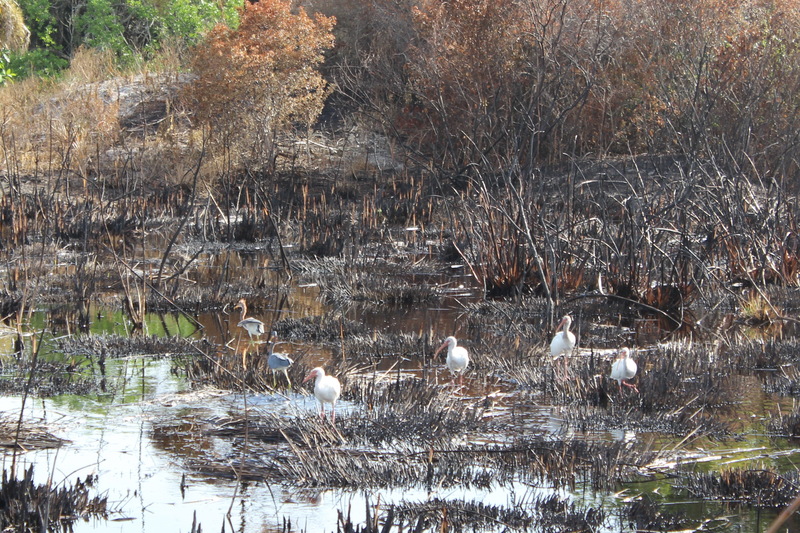 According to the USFWS website, the goal is to restore this area to ‘Spartina marsh’ habitat. Same burned area adjacent to boardwalk, exactly one year later! Edge of Tarpon Bay, from a kayak. 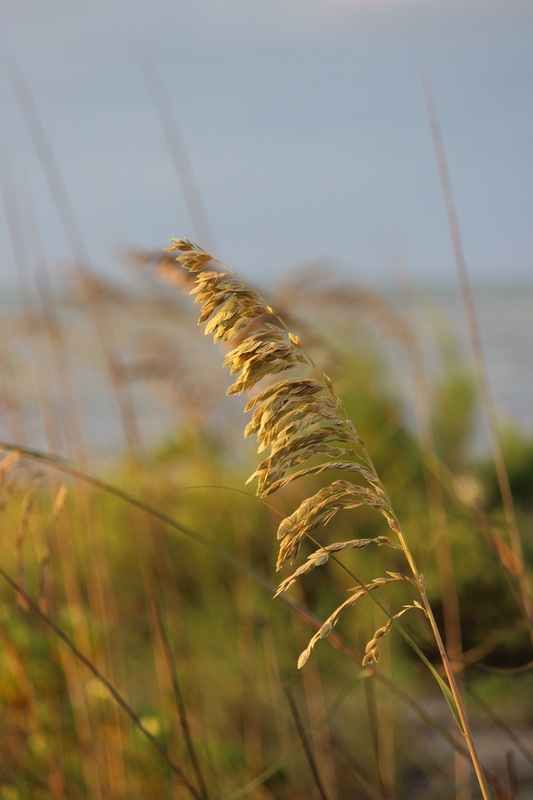 Sanibel-Captiva is a study in edges. 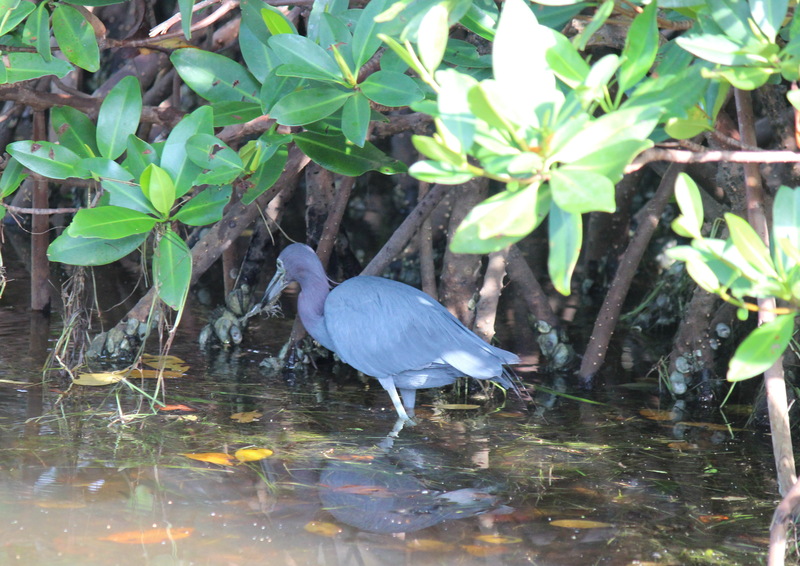 Mangroves dominate the northern bay shores – these species have some fascinating adaptations. Red Mangrove propagules, (seedlings) ready to drop. 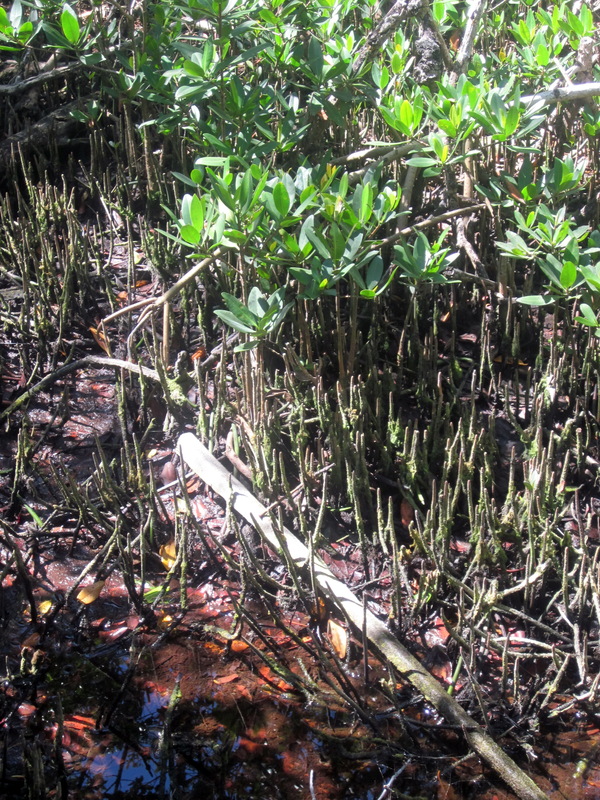 Red Mangrove, Rhizophora mangle, with its prop roots, drop roots, and pencil-shaped propagules, is the most salt-tolerant of the island’s 3 species. These trees exclude salt at their root surfaces, and can also store and excrete some salt in their leaves and fruit. 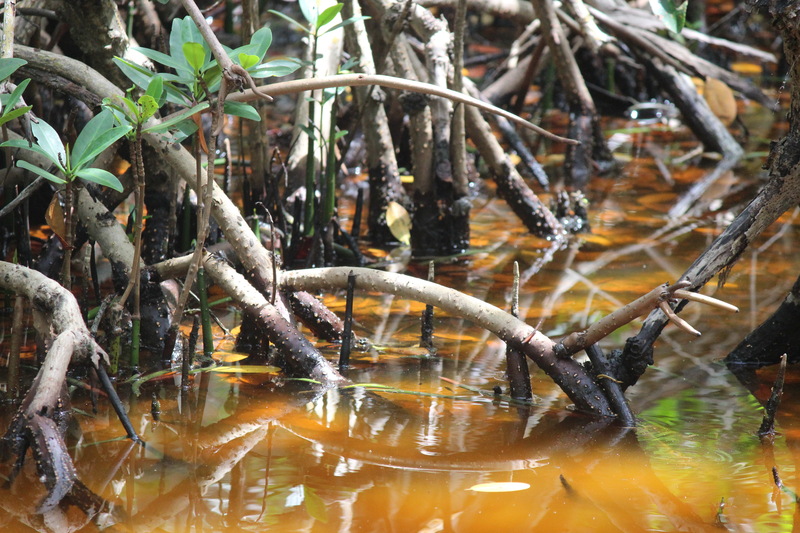 Red Mangrove prop roots in the tannin-stained edge waters of Tarpon Bay. Check out the lenticels (for gas exchange/O2 movement) on the roots. 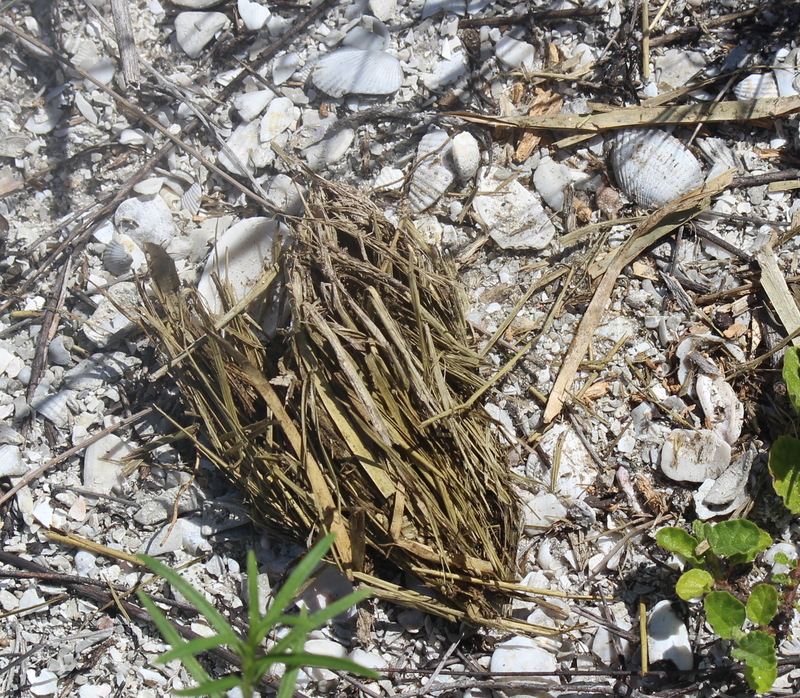 These may be the pneumatophores of Black Mangrove – this photo was taken last spring, at Ding Darling NWR. 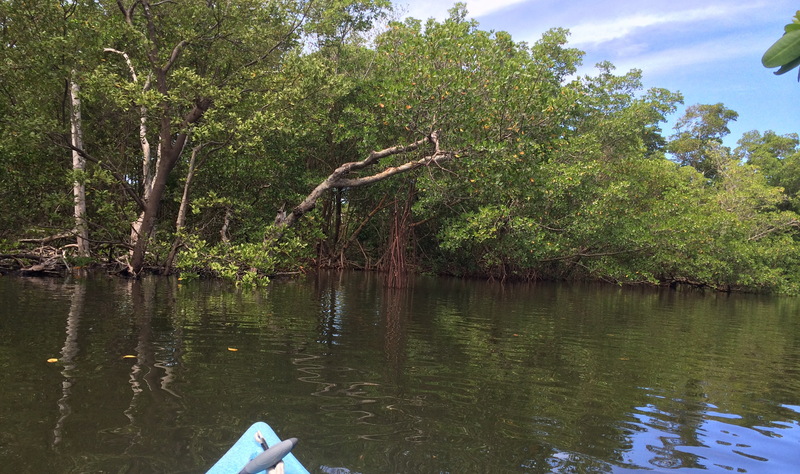 At slightly higher elevations, the Black Mangrove, Avicennia germinans, can be recognized easily by pneumatophores surrounding the trunk – vertical structures which allow these trees to access oxygen in the anaerobic soil of high-tide areas. 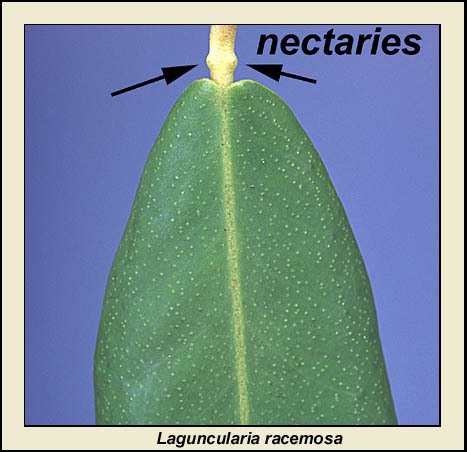 White Mangrove leaf and glands, from University of Florida’s School of Forest Resources. 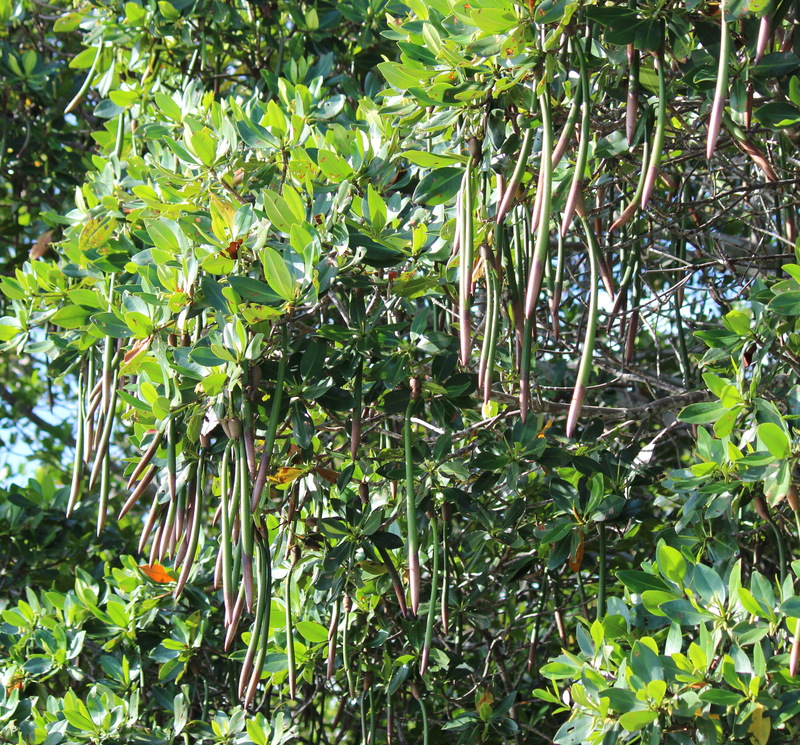 White Mangrove, Laguncularia racemosa, is found mixed with Red and Black Mangroves, slightly more inland, and can be distinguished by its more rounded leaves that have 2 sugar-excreting glands at their bases. 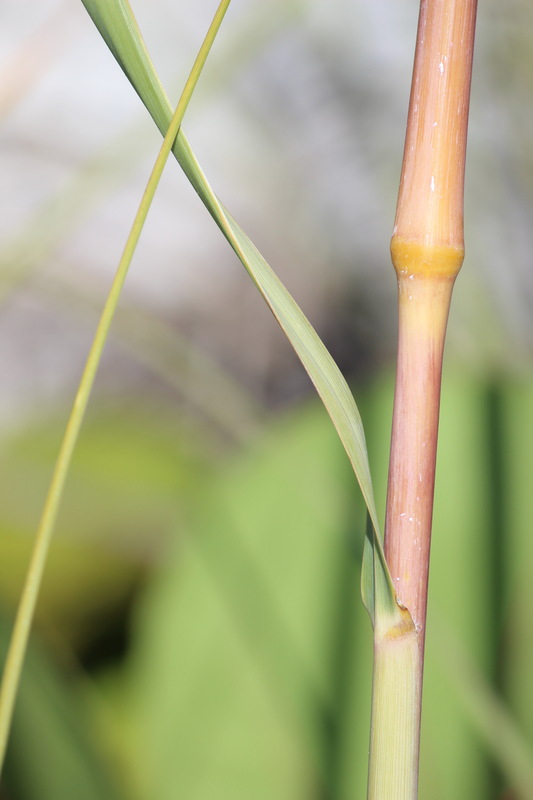 White Mangroves have the smallest propagules, and much smaller ‘peg root’ pneumatophores. Unlike Red Mangroves, both Black and White Mangroves predominantly excrete salt through their leaf surfaces. Buttonwood in flower at the Bailey Tract. 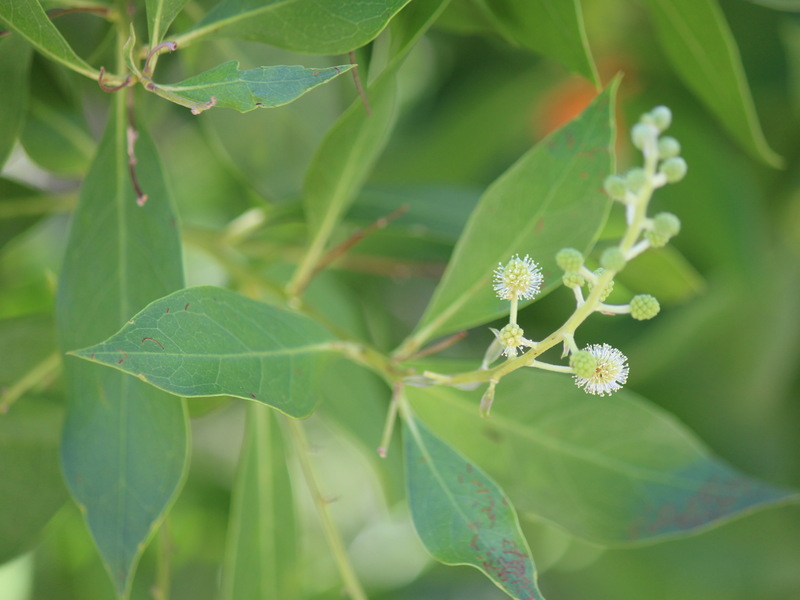 Buttonwood, Conocarpus erectus, another common associate, produces seeds rather than propagules, and is found just inland/upland from the mangroves. 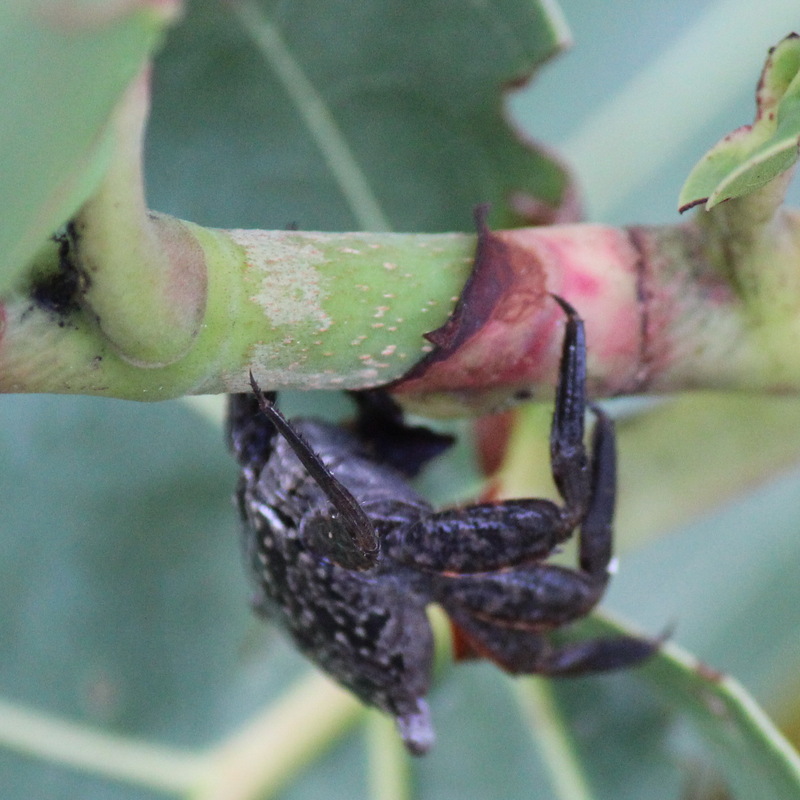 Mangrove Tree Crab, aka Aratus pisonii, NOT on a mangrove, but high up on a Sea Grape, aka Coccoloba uvifera, at Ding Darling NWR. These plants form the structure of a fascinating food web that relies on tidal fluctuation, leaf litter, shredding and decomposing organisms, algae, over 200 species of fish, and an incredible variety of birds. 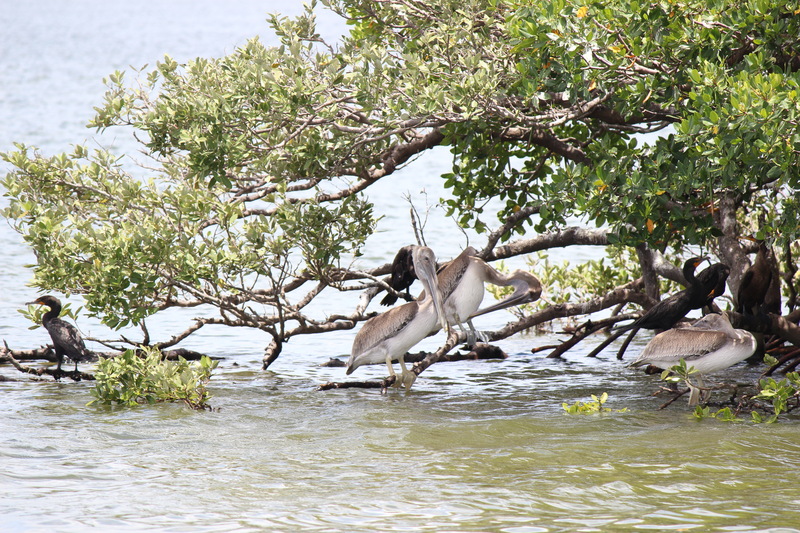 High tide with young pelicans and cormorants at spoil island in Tarpon Bay. 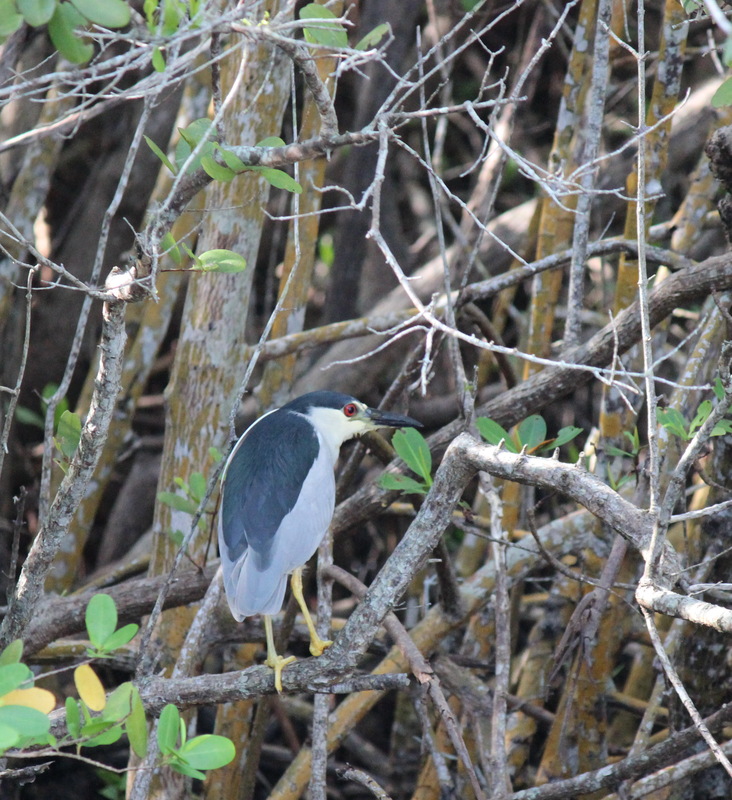 Black-crowned Night Heron, resting low in the mangroves at Ding Darling NWR. 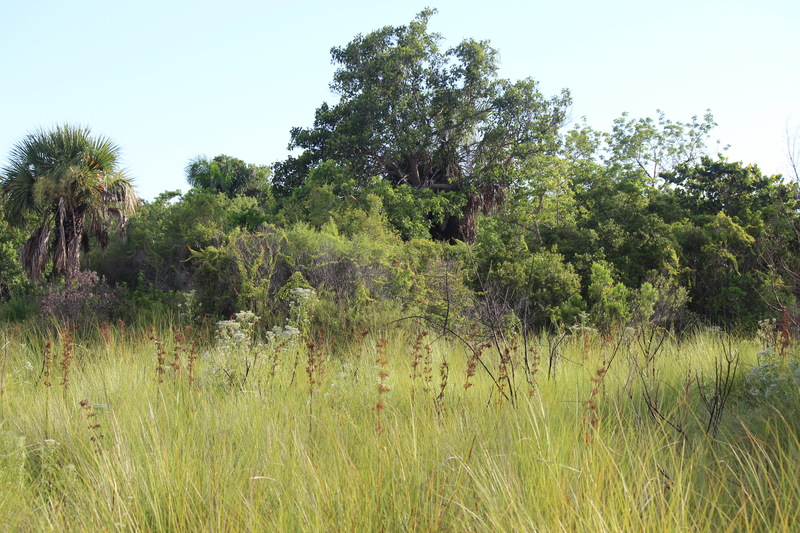 The state of Florida and the City of Sanibel recognize the value and importance of this plant community to the ecology and economy of southwestern FL, and have laws and rules regarding any action that involves mangroves. Many of these rules were established in the late 1960’s and early 70’s. Florida might be known for ‘crazy,’ (see ‘Fake or Florida,‘ Seth Myers’ hilarious sketch…) but it has been doing a few things right, maybe North Carolina can take a listen?! 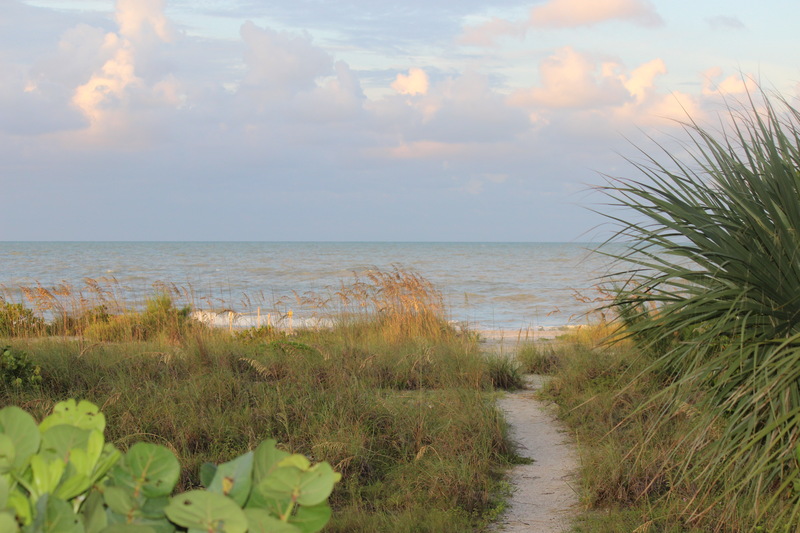 The Sanibel-Captiva Island complex is a special place. We were just visitors, but could appreciate the effort that must be necessary to keep so much of the island in conservation. The stunning ~6,200-acre J. N. “Ding” Darling NWR makes up most of the northern mangrove-dominated portions of both islands. 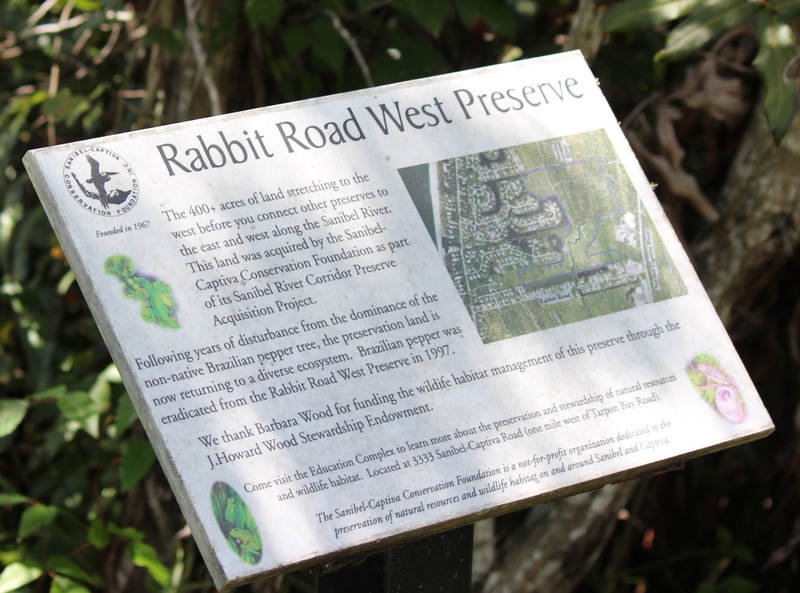 Sanibel-Captiva Conservation Foundation owns and manages another ~1,800 acres, and has yet another ~800 acres in active habitat restoration. Residential and commercial development are present, but it is clear that environmental stewardship is a priority. bike path signage, one of many all over the islands. 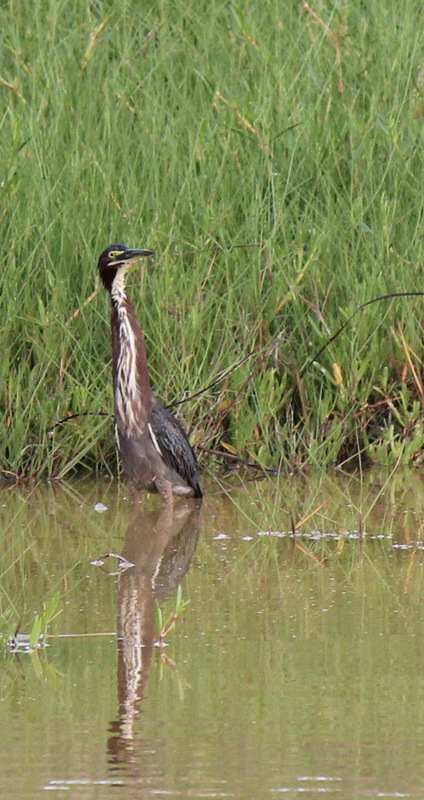 Wildlife sightings during our visit were so numerous that it will take several posts just to share some of the photos. 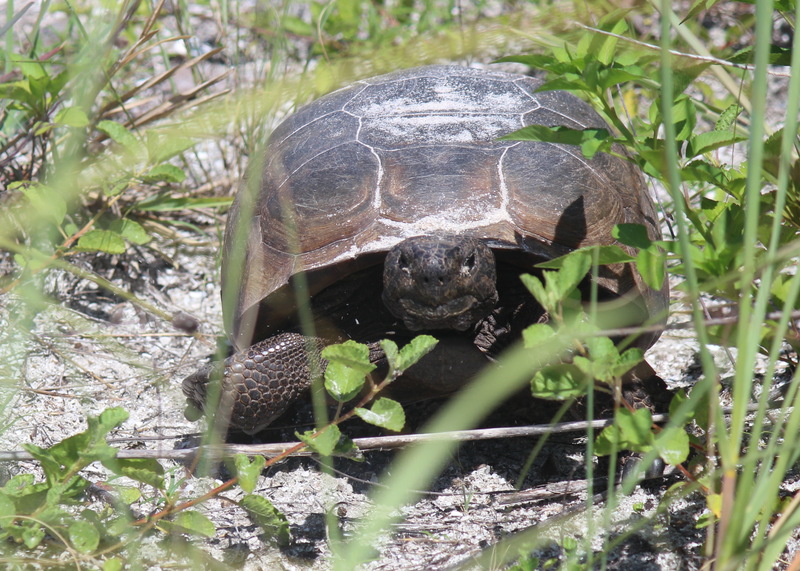 Our welcome included a resident Gopher Tortoise, Gopherus polyphemus, considered a ‘keystone’ species because several hundred species also make use of their enormous burrows. gopher tortoise, heading back to burrow after lunch. Gopher tortoises are large, heavy, and mostly herbivorous. The turtle living in the nearby sand flats/back beach area had a burrow very close to a path to the beach, and did not seem perturbed by our curiosity. 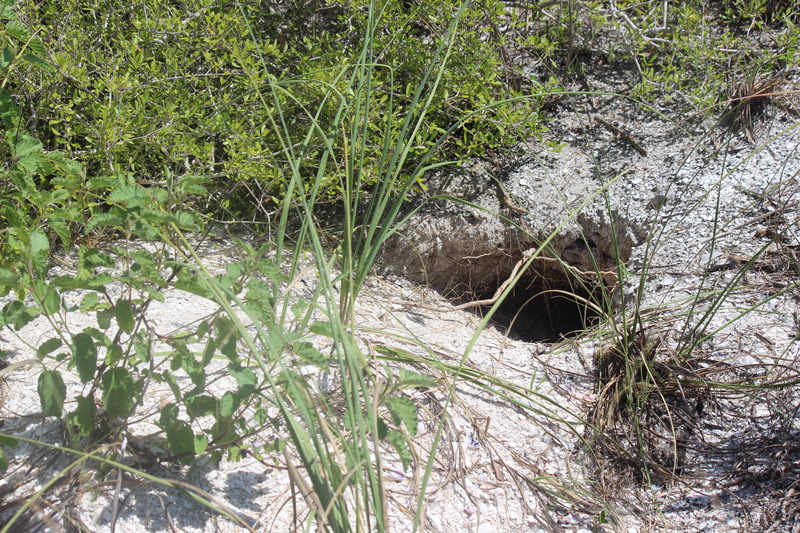 the gopher tortoise used this burrow regularly, tucking its body sideways a couple of feet from the entrance. Nearly every day, during daylight hours, this turtle could be seen moving back and forth, munching on (and pooping in) the vegetation, or cooling off in its burrow, one of several we noticed in a about a hundred square-foot area. 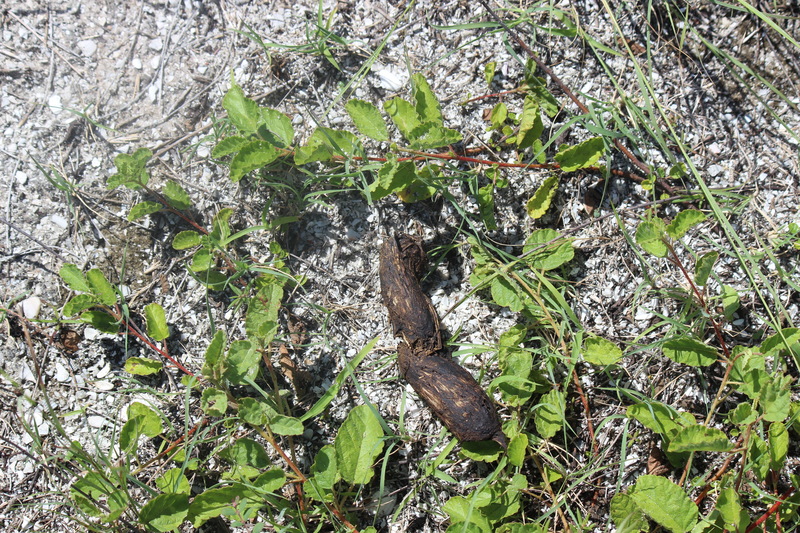 this fibrous turd was one of MANY we saw along the path, and throughout this turtle’s home-range area. careful examination reveals a poop composition of mostly grassy fibers. The forage area of this turtle was easy to see – the vegetation was much more sparse in the areas just beyond the burrows. 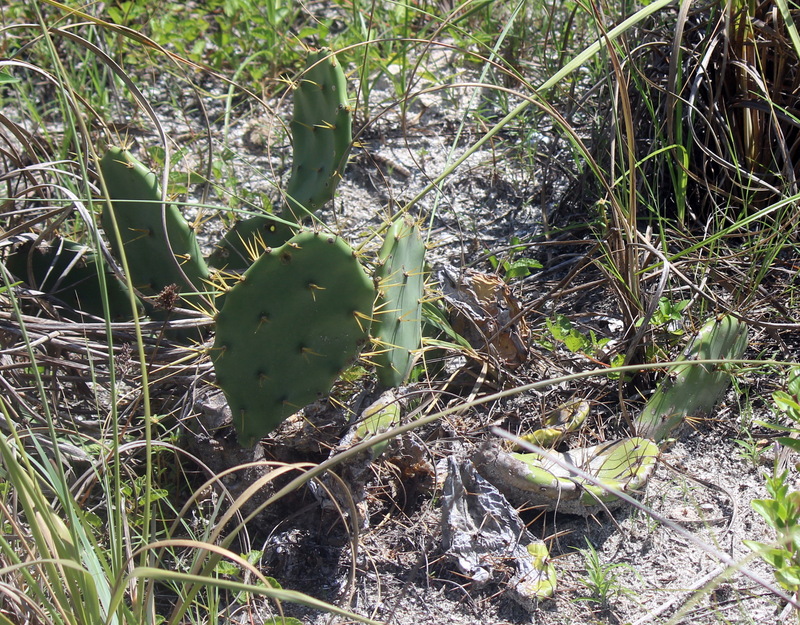 Prickly Pear, aka Opuntia humifusa – a Gopher Tortoise favorite.